Today, we have the Chief Executive of the United States promoting hate against Muslims. Trump has tried to pass across-the-board ban against Muslims coming to the US from Muslim-majority countries (he has said Christians from the same countries would be okay), he has regularly said things against Muslims (“Islam hates us”) and today, he forwarded a Tweet from a British anti-Muslim hate-monger. His Cabinet members are selected in part, for their hate against Islam and Muslims and agencies’ heads are notable for their hate and suspicion of Muslims. Our two-party Congress has the Republican Party that is committed to hate Islam and Muslims while our Gutless Democratic Party acquiesces silently because they don’t want to be seen as “weak on Security”. Laws have been passed in the name of “Keeping us safe”, that only have teeth against Muslims. Courts have held Muslims guilty and sentenced to over a decade each while “nice White Christians and Jews” are considered to be exercising their constitutional rights for acts that far exceed anything in which Muslims are found guilty of crimes. Torture has been banned…except when it is targeted against Muslims who are removed to Ghost Prisons overseas on the thin reasoning that if it is not being done in the US, it is not covered by our constitution. Great, why not have slaves in American embassies and allow US corporations to use forced labor as well? Would torture of a US citizen be okay under the constitution? I suppose so because we have already murdered US citizens just on Presidential order under Obama. Even schools and teachers, have found it encouraging to target Muslims as Sleeper-Cells and brutal murderers. Even Churches, Synagogues and other Christian and Jewish organizations, have joined in the Hate-Muslims clamor by actively poisoning their congregations’ minds as they invite anti-Muslim hate-mongers to speak against Islam and Muslims, with the stated reasoning of either protecting the US or, protecting Jews. 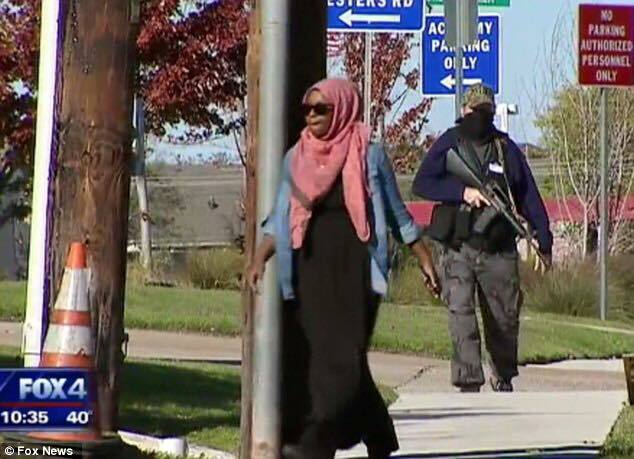 The “normal American” Republicans see themselves as defending America when they harass Muslims by calling them “Terrorists”, by picketing Mosques while openly armed and while stalking “Muslim-looking” people while holding semi-automatic weapons. Talk-show hosts and columnists are openly promoting hate against Islam and Muslims; ironically, some are even calling for a “Final Solution” to the Muslim Threat in “their country”. Muslims, and most Westerners today, don’t seem to understand the progression… the degeneration of violence in any population so most people sit there, complain quietly and do nothing active against what is going on; few, if any people, are held accountable for their venom against Islam and Muslims. The tragic fact is that this is exactly the pattern of events that lead to a genocide of a helpless, silent, minority. Just over the past 100 years, take your pick from the WWII Shoah in Germany to Butchery of ethnic Chinese in Indonesia, Aborigines in Australia, Tutsis in Rwanda, Muslims in Bosnia, Muslims in Burma and that is a short list! Today, Muslims are in a position to take assertive political action, to take our political leaders to task and force them into action against hate but we have so far, preferred to remain silent, anxious to show we are “moderate Muslims”. We have raised funds for politicians, we have mobilized votes for our politicians, but we have NEVER asked them to take assertive, aggressive, action against Islamophobia. We Muslims need to be aware that tsunamis rise silently. It is only when they hit shores that one can feel the violence and the mass of the built-up waters but by that time, it is too late. Muslims need to wake up fast, before we can awaken the rest of the good people in America; the bad Americans are already awake. Hang in there Jeff, the bigots will lose eventually, they’re on the wrong side of history. Deep down they know it, so they’re scared and reckless. Just stick around and stay safe and you’ll be proven right.